The front mid-engined, rear-wheel drive vehicle is powered by a naturally-aspirated, 7.0-litre V12 petrol engine. 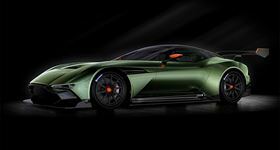 The Aston Martin Vulcan sports car features a carbon fibre monocoque and body. The car features a carbon fiber monocoque and body constructed by Aston Martin’s long-term specialist body engineering and manufacturing partner Multimatic, along with an integral limited-slip differential, magnesium torque tube with carbon fiber propeller shaft. The new supercar will be limited to just 24 examples worldwide. This story is reprinted from material from Aston Martin, with editorial changes made by Materials Today. The views expressed in this article do not necessarily represent those of Elsevier. Link to original source.